Mystified by which books to give for Christmas? Never fear, this week I present to you the Maison Cupcake Bumper Books for Christmas Gifts Guide to be served in SIX digestible parts – each with their own giveaway. Most of the titles featured came out, or where re-issued during 2011. Some I bought myself, some were review copies from publishers, some I’ve gazed at in bookstores, all would make a ideal gifts for someone. 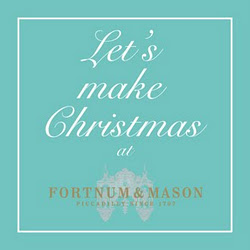 Today I’m featuring books for making your own gifts which seems timely after I have just attended the Let’s Make Christmas home made gift swapping event at Fortnum & Mason on Friday (above). I have lots of pictures to show you below of the goodies everyone made and swapped. Aaaand then, for those of you don’t yet have a one, I have a pretty pink copy of Prepped! to giveaway. Any of these books would make super presents… or you can buy yourself a copy and get a head start DIY-ing making home made Christmas gifts. For the person who fantasises about having a house with a pantry: Yep, that’s me. Ham, Pickles and Jam is a mine of information telling you how to cure meats, preserve gluts of fruit and even air dry your own biltong. Thane Prince’s competent book moves through all too often forgotten skills for the modern kitchen larder giving you the techniques and confidence to fill your cupboards and your pantry (if you’re fortunate enough to have one these days). Pork pies, terrines, rillettes and chutneys; you’ll never bother shopping in Waitrose again and probably start spinning your own wool and dipping candles from the by products of sheep. Arguably air drying your own jerky is only one step away from tanning your own leather jackets but I think I’ll stick to cooking! Ham, Pickles and Jam by Thane Prince is published by Pavilion in hardback RRP £25. For the recipient who enjoys giving back: Ok maybe it’s altruistic to present someone with a book how to make Gifts from the Kitchen because with wonderful things in here you’re bound to have at the back of your mind that you wish the recipient would make something in it for you. I first received a copy of this at the joyfully creative Miele Food For Gifts cookery class and highly recommend it for anyone who likes making stuff rather than buying it. Not just limited to Christmas presents, Annie Rigg shows an array of foodie presents suitable for all occasions during the year and various family members. Every item is beautifully presented giving you inspiration to wrap, bottle and label your wares in your individual style. 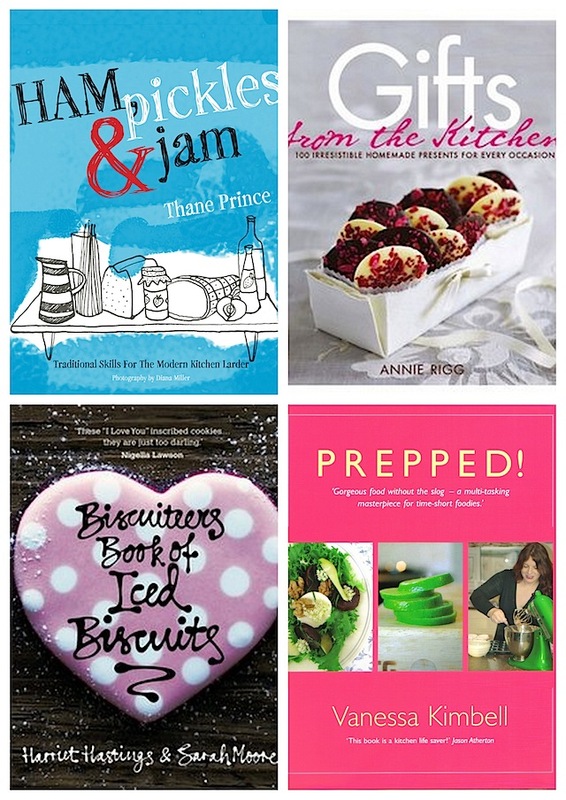 Gifts from the kitchen: 100 Irrestible Homemade Presents for Every Occasion by Annie Rigg is published in hardback by Kyle Cathie RRP £16.99. For the time-short goddess on a budget: Vanessa Kimbell packed her trunk and said goodbye to the circus… well not quite, she packed in her former corporate life and put her earlier acquired cheffing skills to good use to write her cookery book, Prepped! inside a year. The result is a creative family friendly tome to pulling together exciting dinners at the drop of a hat by making use of core recipes for flavoured sugars, syrups and sauces. You could either give this book to someone in its own right or buy yourself a copy and give someone home made gifts packaging up the core recipes from the book. Star recipes are brocolli with hot vanilla vinaigrette and lavender salmon which sound like they shouldn’t work but do. Aspirational in style, this book has look of Country Living Magazine about it and I’ve got a copy to give away below. Prepped! : Gorgeous Food without the slog – multi tasking masterpiece for time-short foodies by Vanessa Kimbell is published by Spring Hill in hardback RRP £20. For the crafty sugar fan: The piping bag’s the limit when it comes to drawing on biscuits, any shape, any colour, any design. The Biscuiteers Book of Iced Biscuits gives a comprehensive guide to decorating cookies to suit different themes and seasons ranging from the bridal collection’s dress, shoes, dove, cake and bouquet to the cowboys and indians’ collection of teepee, boots, horse, native American headdress, stetson and cactus. For anyone who is a fan of blogs like Sweetopia and Bake at 350, Biscuiteers gives a hard copy guide to make any cookie decorating fan crumble with excitement.The Biscuiteers Book of Iced Biscuits by Sarah Moore and Harriet Hastings is published in hardback by Kyle Cathie RRP £14.99. With thanks to Pavilion and Vanessa Kimbell for the review copies. Come back for the next post when Part Two of the Maison Cupcake Bumper Books Christmas Gift Guide will feature the most beautiful cake and confectionery books of the year. 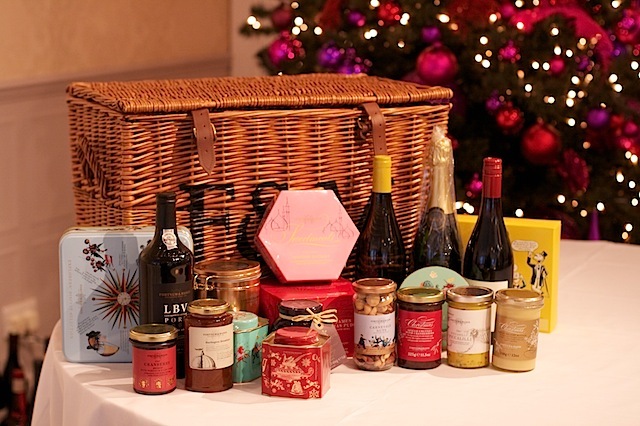 Fifty food bloggers were whipped together for a seasonal frenzy of festive gift swapping at food lover’s emphorium Fortnum and Mason. 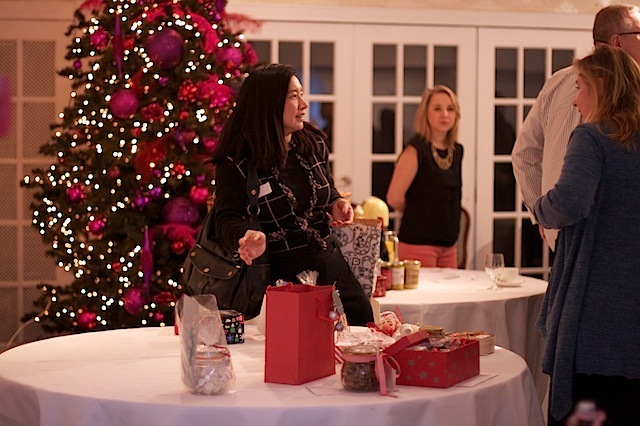 Let’s Make Christmas was the brainchild of Prepped! 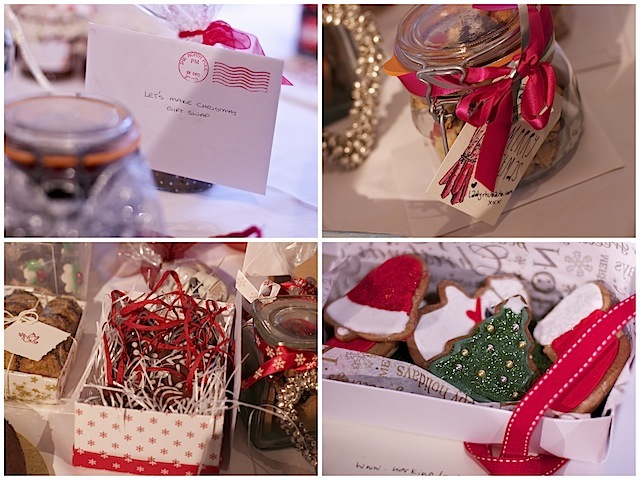 author Vanessa Kimbell for which she invited her favourite food bloggers to make and swap a Christmassy gift. 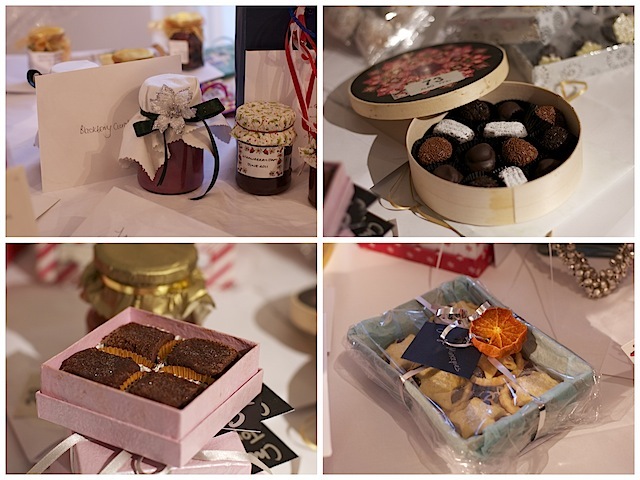 To give added impetus, there were a series of prizes on offer for various categories such as preserves, sweets, biscuits, cakes etc. These included a Kenwood mixer, classes at Leith’s and a Fortnum’s hamper as shown above. Out of the house for the first time with my new 50mm lens I concentrated on taking pictures of people and the goodies. Excuse me if I don’t know everyone’s names but I will point out those whom I can. That’s May from Slow Food Kitchen arriving in front of the tree. The tables were quickly filled with everyone’s parcels. 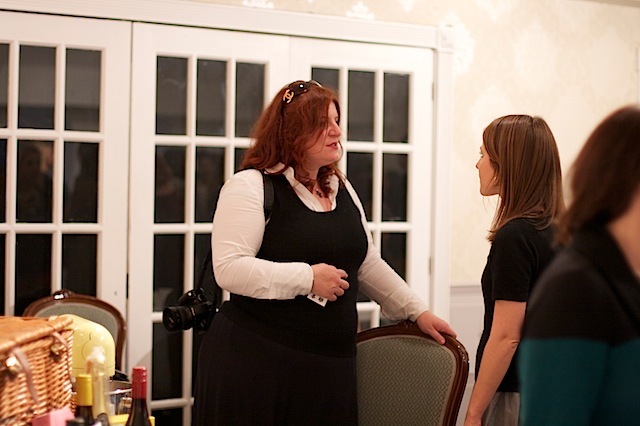 That’s Charlotte of Go Free Cakes whom I had the pleasure of meeting for the first time. The charming Ben Vear of Winstone’s Ices and author of “Make Your Own Organic Ice Cream”, Jayne Rivera Lynch, not sure, the back of Rachel Mozart”s Girl‘s head and not sure. (Feel free to comment with names and links please). Helen Fuss Free Flavours with Sarah Food for Think. Solange Pebble Soup and French lady – help with name /site please! Not sure who lady with back to camera is, that’s Penny in the middle and not sure who blonde lady is but am sure someone will identify her. 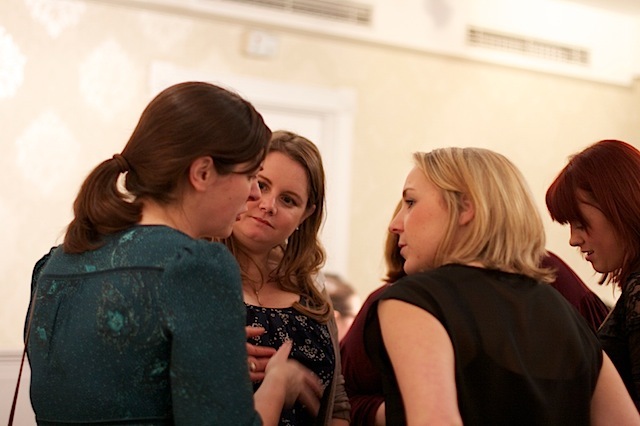 Whilst we were all socialising and chattering, some SERIOUS JUDGING was going on. 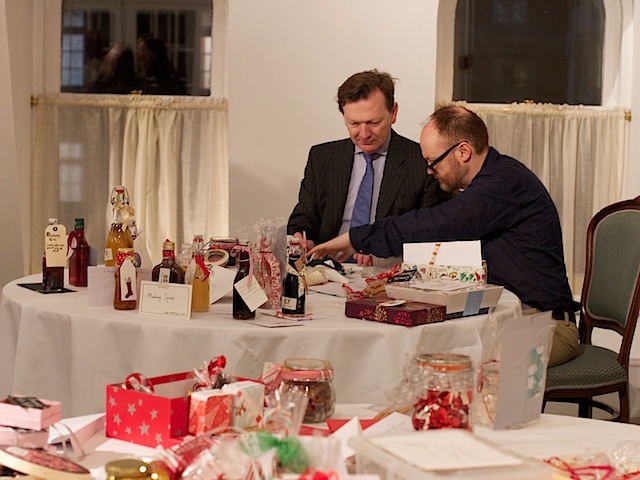 Baking writer Dan Lepard and a top Fortnum’s taster/buyer/manager *delete as appropriate I’m not sure what his title was – had the tortuous task of selecting which ones were most worthy winners. They were working to a criteria of which ones captured the essence of Christmas and then judging on taste. (Clearly my Christmas pud cake pops slung in a plastic Ikea box were never in the running – have you ever tried to transport cake pops standing up? Nightmare, hence plastic box. 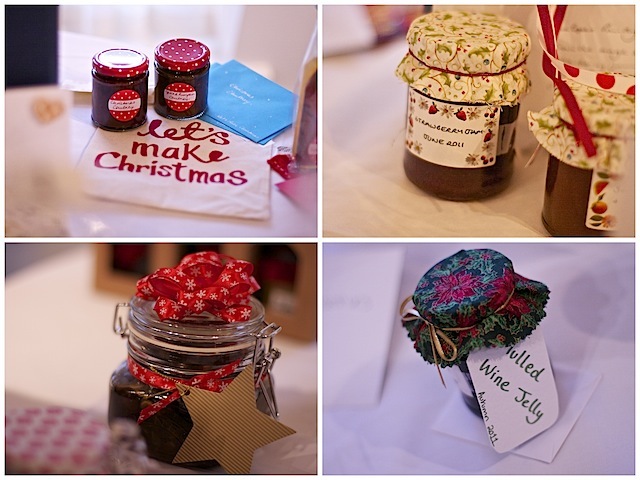 Top left includes christmas pudding by Claire at Things We Make. 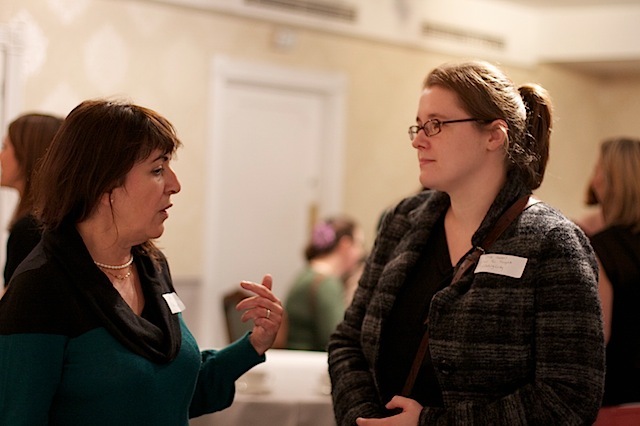 Claire was probably the first ever food blogger I met in real life some two years ago and I was delighted to get the opportunity for a good chin wag again. Bottom right are Working London Mummy‘s super sparkling cookies. Top left are Gail‘s spotty jars of something sticky and delicious with gorgeous calico bags! Top left is Urvashi Botanical Baker‘s blackberry curd (winner in her category) and top right are some fabulously chocolatey truffles by Sue Tales from the Giant”s Wood that I “won” to take home later. Huge thanks are owed to Vanessa for pulling everybody together for this memorable friendly event. The word “dynamo” has already been hailed by Solange but it’s an apt one. 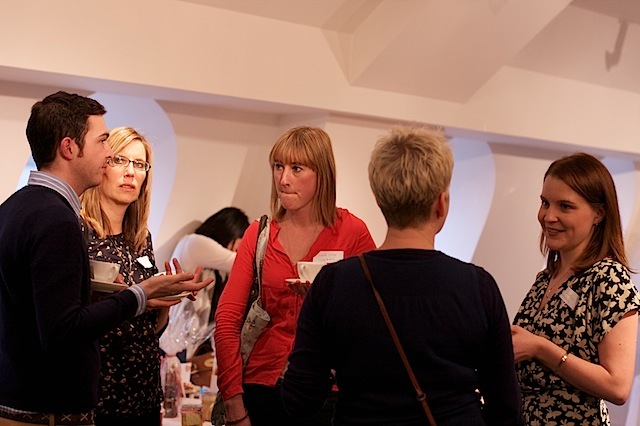 For some people present it was the first time they had met so many other food bloggers at once and although those of us in London frequently see each other at various shin-digs and parties, it’s a rare treat for many of those further afield. I was delighted to meet Choclette and Dom at last and also to catch up with others whom I’d not seen for months or years. If you’d like to grab some of Vanessa’s energy then you can enter today’s giveaway to win a copy of Prepped! by following the instructions below. 1. Open to UK participants over the age of 18. 2. 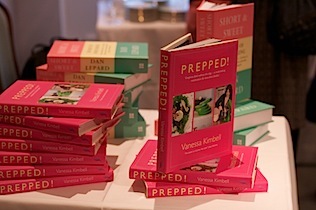 The prize is one copy of Prepped by Vanessa Kimbell. 4. Entries using any software or automated process to make bulk entries will be disqualified. 5. I am despatching this prize personally, my decision is final and binding on the entrants and no further correspondence will be entered into. 6.There is no cash or other alternative to the prize stated and the prize is not transferable and no part or parts of the prize may be substituted for other benefits, items or additions. 7. The winner will be picked at random (by Rafflecopter using random.org) and contacted by email; if they do not respond within 7 days another winner may be chosen. The prize will be delivered to the winner as soon as possible following confirmation of delivery address. For a chance of winning simply fill in the form below. If there is no form then hit refresh and it should soon appear. If you do not fill in the form your entries will not go into the draw; one of the mandatory means of entry is to leave a blog comment so you need to do this as well as completing the form. Come back every day for extra bonus entries for even more opportunities to win! Click here to visit more great Maison Cupcake giveaways! NB If you are reading this via email subscription, click through to view this post in your browser to enter. Glad you enjoyed! It’s quite a spread isn’t it. What a great post! It was such a fun, festive afternoon and I thoroughly enjoyed looking at your lovely pictures which brought back some great memories of a super time. Aww and I’m not sure we got to speak? There were so many people there I’d either not met before or not seen for ages. Hopefully we’ll get another opportunity! Thanks! Was great to meet you! I do like fig rolls! It looks like you all had a great time, I wish I could have joined you! All the gifts looked so pretty! Hi Regula, you missed a real treat! Amazing write up and beautiful clicks. I really wish I could have been there but alas work calls. Hopefully there will be a similar event in the next year. I love making homemade gifts but am a little short on time this year. The only book I have of the ones you’ve showcased is the biscuiteer book but have been eyeing all the others. Would love to add prepped to my collection! Lovely post Sarah. It was a pleasure to meet you too! Your photos are gorgeous, really catch the spirit of the event. Very nice picture of my chocolate chestnut cake ; ) I won the strawberry jam and whiskey marmalade which you have photographed…goes anyone know who brought these so I can thank them? I don’t know who won it but hopefully someone reading this will declare themselves! Wonderful account of the event and the photographs are amazing, you really brought it to life here for those of us who could not attend. And, the items everyone made…Wow! Really enjoyed reading this, thanks! No it’s definitely a French lady, Solange was chattering away to her! And I know who Karen is. But thanks! I’m thinking about making hand-rolled chocolate truffles as presents this year and maybe some posh mince pie/ Bakewell tarts. I’m getting very excited about making the Christmas dinner too! Lovely write up of a great day! It was lovely to finally meet you! 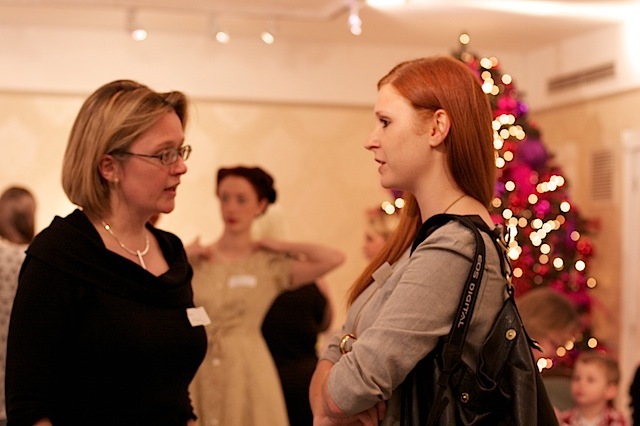 The lady in orange next to me is @LadyRhubarb on twitter and the “French lady” is @BakingCindy (Food for Thoughts), I seem to remember twitter names more easily than real names! I make Christmas cake for my dad and sister each year and last year I made stollen for my husband and some friends of mine. I make tree decorations each year last years were made of salt dough and this years are felt. I think that thriftyness is the upside of the recession. Hand made gifts are so much nicer, to give and recieve. Thanks for all your great inspiration! I’m looking forward to making my Christmas cake tonight – who needs Waitrose! I usually make gifts for my daughter’s teachers, the past couple of years it was cookies. Two years ago I wasnt working so everyone received a crocheted scarf for christmas. This year, my daughter and I are making fudge and lebkuchens, hopefully some will be left to actually give to people. I don’t do anything, no one would appreciate it, unfortunately. Lovely write up and fabulous photos. 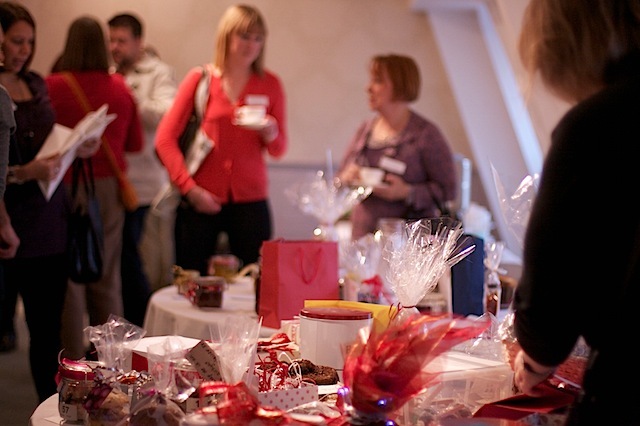 I’m feeling such a numpty, I just didn’t get my camera out enough so didn’t do justice to all those amazing foodie gifts decorating the tables. It was a fabulous event and good on Vanessa for organising it. I was really pleased to recognise you in the lift on the way in and to finally meet you. Thanks for the mention too. Shamefully, I do not have a copy of Prepped. I was umming and ahhing as to getting one on the day, but the thought of having to lug my rather heavy bag all around the place and then to Birmingham the following day, put me off. So am entering now in the hope I might finally get a copy! 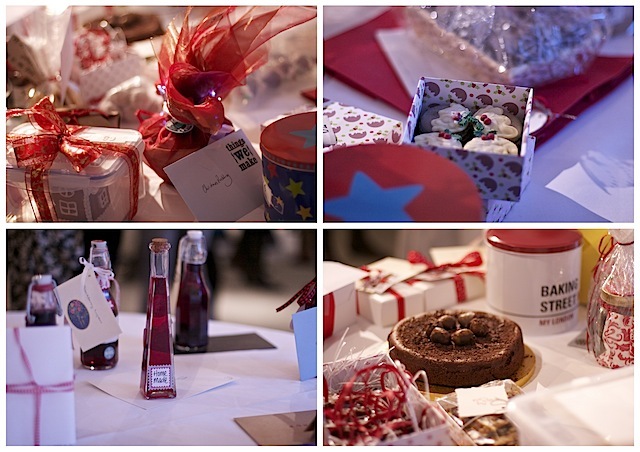 Yes, indeed I do make gifts – foodie gifts of all kinds, but none so beautifully packaged as those I saw last Friday. I love making gorgeous chocolate truffles rolled in different coatings! And also Nigella Mini chocolate puddings that look so divine! What a wonderful post and competition too! nothing home made, I need some inspiration! I make mince pies and shortbread for my family. This year I am going to have a go at making a holly wreath with dried fruit. Nothing home made although I used to make decorations. I’ve been busy making eats and treats and gathering together everything for my Christmas Hampers! Its the first year I’ve made them, and every weekend I make something new, with the biscuits and nuts being prepped in the final week. Everything is gluten free too, so it’s been a real adventure! Your pictures look lovely from F&M, wish I could have been there! 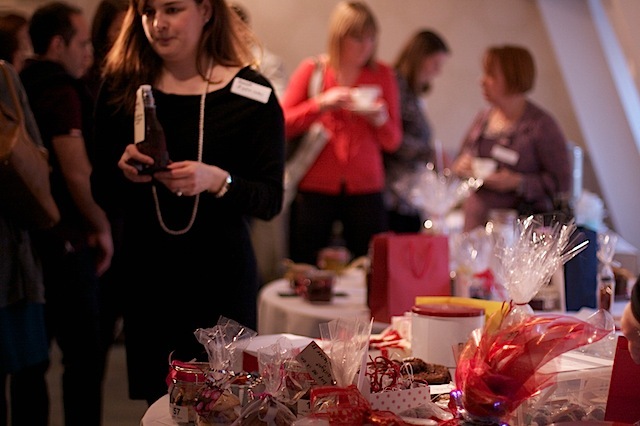 A lovely write up of such a fantastic event. 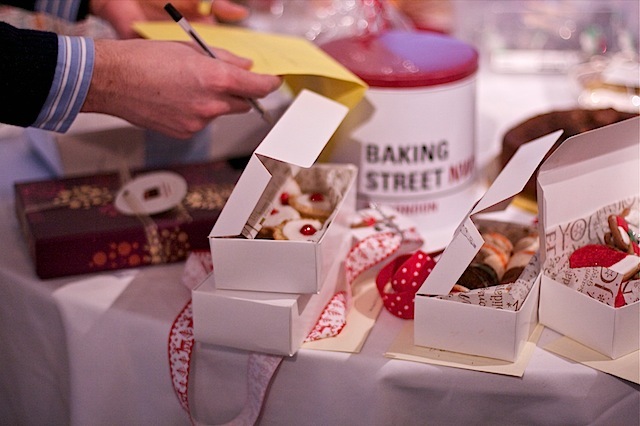 I love my 50mm lens too, they’re so useful and you took some great pics ( thanks for including my Christmas pud macarons). I don’t think we got to meet, hope we get to chat at another event. I am so jealous of everyone who attended. It would have been lovely to be able to meet the people who write all the lovely blogs I read. Plus the goodies all look amazing! I always have plans to make gifts, but never get around to it! 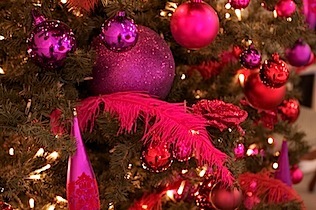 Thanks for writing all about the Let’s make Christmas event. Looked like a lot of fun! Would love to go myself next year! I will be assisting my wife in the kitchen in making some home-made Christmas treats! I have a few jars of Parsnip, Carrot and Apple Chutney which I will be giving as gifts. I may also make some Peppermint Creams to go with family gifts too. We have just brought a bisciut gun so will be making mini cookies dipped in chocolate also christmas cupcakes as well as the traditional mince pies. I’ve just started making my own gifts, cookie jars and aprons and I love it! Been made redundant from my job in a bank and actually feel excited at the chance to do something creative and fun. This event at F&M sounds brilliant. I make Chocolate truffles every year, but after looking at your Fruit Cake pops, I think I might do those this year instead. the biscuit book looks amazing. lucky girls!